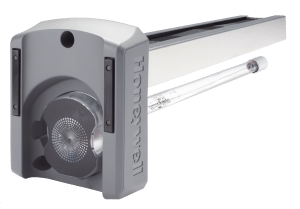 Go beyond capturing particles in a filter with the mold and bacteria killing properties of a UV light. Fox recommends Honeywell ® UV lightsand odor absorbing products. Every time your heating and cooling system turns on, and air runs through your ductwork, there can be bacteria, mold and germs blowing through it. In Seattle, we have plenty of moisture in the air. In winter, when it’s most rainy, we tend to keep our windows closed, a potential opportunity for mold to grow. And if you keep cool with an air source heat pump or air conditioner, the condensing coil can serve as a breeding ground for mold too. While an electronic air cleaner or media filter will collect particles, dust and smoke well, it might miss some smaller particles like viruses and bacteria. In addition, the filter catches things that move with the airflow, while some mold and microorganisms may be growing right on the furnace coil or drip pan. Those situations are remedied by the addition of a UV light. UV is powerful but it’s also completely safe. Hospitals have been using these effective products for many years. A UV treatment system, such as the Honeywell 24V Air Purifier, can help protect your family. 87% of airborne bacteria passing by the system are killed, and 99.9% of mold on the coil. It’s odor absorbing AirBRIGHT™ component further purifies the air by reducing VOC’s (Volatile Organic Compounds) that pass through the system. Clean air benefits everyone in the home, but a UV system is especially recommended for those who live in a humid climate, allergy sufferers, or where there are cooking or pet odor concerns. Call today and Talk to Fox about UV Air Purification products or ask your Fox HVAC Specialist for an air quality upgrade with your next furnace maintenance.